Today we had a few spare hours to dodge raindrops on a hike with Csaba and Bugsy, the innpugs, and to do some geocaching on the way home. We originally considered taking the pugs to the dog park in Black Mountain but decided instead to go to the beautiful town of Montreat just north of Black Mountain, which has over 15 hiking trails of all different levels of difficulty. We chose the Rainbow Road trail just off Montreat’s Lookout Mountain trail parking area. The entire length of Rainbow Road is almost two miles of easy terrain along an old road bed and we probably made it about a third of a mile before the thunder really started rolling along the mountains around us. 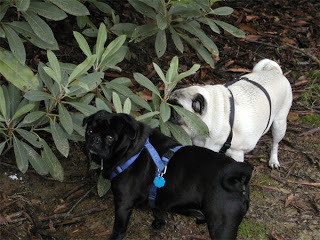 Interestingly, thunder doesn’t bother the innpugs, but they don’t like getting their feet wet, so we thought it best to head back before getting caught in a rainstorm. What a beautiful hike, that Rainbow Road! 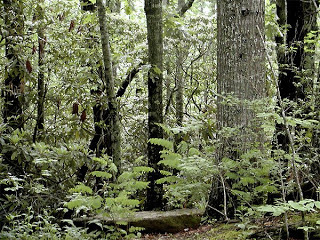 We’re adding the trail to our list of hikes for summer (see our 10 spring hikes in the North Carolina mountains) because it is nice and shady and green all around. 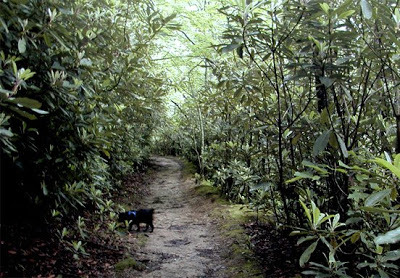 We almost want to call it Rhododendron Road because of the vast thickets of rhododendron that surround the path; in some places you feel like you’re going through a tall rhododendron tunnel. It’s fantastic. The area is called Royal Gorge and was the site of a Civil War skirmish and is now the site of a clever geocache called Froot Loops. Brigette found it after a few minutes and we were on our way with innpugs in tow, ready to call it a day. 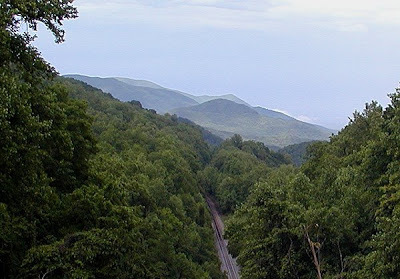 This entry was posted in Uncategorized and tagged geocaching, hiking, Montreat, outdoors by Inn on Mill Creek. Bookmark the permalink.